The newly built Best Western Blue Square Hotel is conveniently located in the western part of Amsterdam. Within a short period of time you are in the city center or at lots of the other points of interest in the city. The Best Western Blue Square Hotel has 173 guest rooms, all well-furnished and beautifully decorated in a classical style. A number of the rooms also enjoy stunning views over the Erasmus canal. Shops are easily accessible nearby and there is a daily market close to the Hotel Blue Square. Alternatively, a short stroll to the Sloterplas lake will present you with opportunities to go fishing, canoeing or sailing. The BEST WESTERN BLUE SQUARE HOTEL is a Tourist hotel. Located in AMSTERDAM area. Shopping is accessible by bus/taxi and the nightlife/restaurants are located in the hotel. Descriptionclass="small" style="text-align: justify; font-size:11px;">The newly built Best Western Blue Square Hotel is conveniently located in the western part of Amsterdam. Within a short period of time you are in the city center or at lots of the other points of interest in the city. The Best Western Blue Square Hotel has 173 guest rooms, all well-furnished and beautifully decorated in a classical style. A number of the rooms also enjoy stunning views over the Erasmus canal. Shops are easily accessible nearby and there is a daily market close to the Hotel Blue Square. Alternatively, a short stroll to the Sloterplas lake will present you with opportunities to go fishing, canoeing or sailing. My partner and I had a weekend away in Amsterdam, we had used a deal on wowcher so weâ€™re not expecting amazing things from the hotel for the price we paid however the car exceeded our expectations. The place was clean and modern and did not smell like weed at all. The usual check in is at 2pm but our flight arrived early so we managed to get to the hotel at about 11:30 and they cleaned and let us check in at 12 instead. We self catered, but the restaurant looked good with a nice size buffet breakfast. To get to the city centre was really easy. About 3 mins down the road is the tram thatâ€™ll take you to all the tourist places and they run every sort of 3-4mins until late so perfect for whatever you wanna get up to. You can also buy your travel tickets for the trams in a vending machine at the hotel cheaper than the airport or Iamstersam website. As well as 3 for 2 deals on the tourist attractions. Highly recommend to anyone looking for a cheap escape but still having somewhere nice to lay your head at night. Our first impression of the hotel was not great due to the large number of smokers on the hotel steps and cigarette ends littering the steps and street. However, once inside, the reception area was clean and the receptionists were all very helpful and friendly. We were given advice, maps and information about travelling around the city. Our room and bathroom were both and clean and our room was comfortable and spacious. On the Saturday night there was loud music until about 11.30 but was quiet after that and quiet for the other 2 nights of our stay. We were room only and feel we had good value for money. We were a little way out of the city centre but the public transport was fantastic. There were bug in the room! As you can imagine I am very worried and disappointed with this situation and I am not glad to be hosted in this hotel again. It is totally unacceptable having this kind of issues in any kind of hotel. 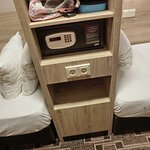 I have reported my claim to the hotel, the XO Hostels company, the manager of the hotel and I did not receive any answer. Lovely hotel about 20 minutes from the City centre. Bus/Tram stops just across the road. Direct very frequent (every 20 mins) bus to airport and transport to city centre/ railway very easy to get to. Hotel is modern, clean, with very welcoming staff. Local travel cards are available next to the snack/ chocolate machine in the reception area.Staff very helpful and reception has all maps, discount cards and trip/ restaurant/ travel information at hand. Recommend you speak to reception and get advise on trips and travel ... We saved a lot of money by using the great transport system in Amsterdam and venturing to the local attractions independently.We had breakfast here as there is a wide choice of foods available and an option of a small basic breakfast if you ask at reception. Breakfast area very relaxed, self service and comfortable seating. We stayed in a good spacious well equipped twin room.Lovely coffee machine, fridge,safe, power shower, toiletries. Beds so comfortable with cosy duvets.Suggest you upgrade from economy twin room for just a little extra like we did. The location is not ideal, but the hotel has everything you need at a good rate for a great stay.